Pro-Am Safety, Inc. is a Western Pennsylvania based stocking distributor of industrial and fire safety products and services. Incorporated in 1982, our 48 member team supports 11 outside sales personnel in Pennsylvania, Ohio, and Florida. Our primary business functions are maintained from our corporate office in Warrendale, PA. The PA and FL locations feature full service maintenance centers for Scott and MSA Industrial SCBA's, MSA Instruments, Miller Fall Protection and D.O.T. Cylinders. We at Pro-Am Safety, Inc. are proud to provide quality products and personalized service to the industrial and fire safety marketplace. Our professional outside sales force retains over 150 years of cumulative safety sales and service experience. We are a direct distributor for over 125 industrial and fire safety product manufacturers including Scott Health and Safety, Sperian, MSA, 3M/Aearo, DBI, Oberon and VF Imagewear. It is our E-Business philosophy to bring that same level of product and service experience to our Internet Customers. Our commitment is to provide the highest quality, most cost effective safety solution to our clients. We welcome the opportunity to discuss your PPE and Safety Equipment requirements. Make the right choice for your employees. 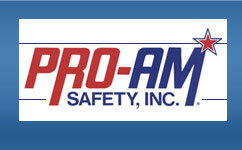 Choose Pro-Am Safety, Inc.
Pro-Am Safety, Inc. has been a member of SMG since 1997. The Safety Marketing Group (SMG) is a network of the dominant industrial safety equipment distributors in North America. Its member companies are unified to furnish the dedicated customer service and flexibility provided best by independent entrepreneurs, owned and operating on a local level. SMG is a corporation -- organized as an industry cooperative -- which is focused on group purchasing and group marketing of quality safety equipment products.